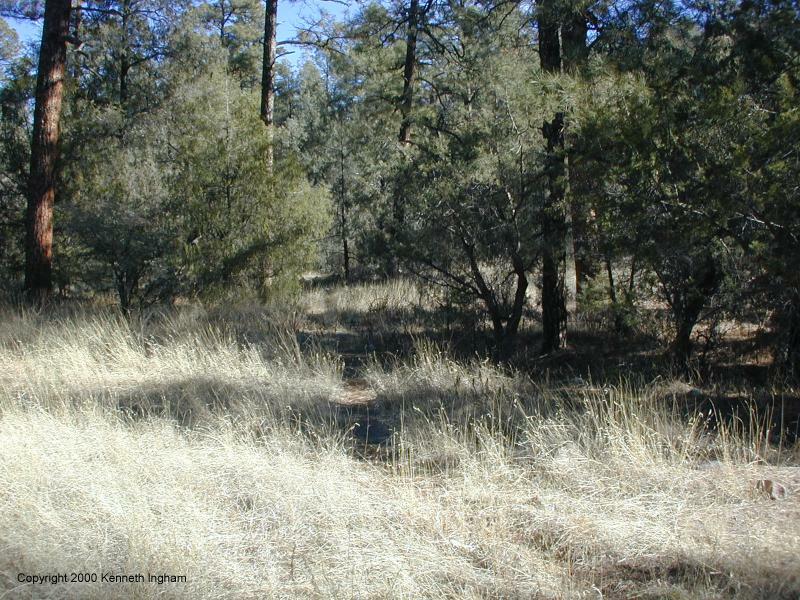 condition: Excellent, other than a 1/4 mile section of the trail which is not maintained (but easy to follow). obstacles: You have to climb into or out of the canyon at one point. The climb is straightforward and does not require special skills. Season: All year. Winter hikability depends on the snow. General notes: All of the trailhead facilities are across the road at the Lake Roberts Picnic area. Trailhead facilities: picnic area, trash can(s), vault toilet(s), water. Time it took us: 2:15. Usage (people/hour): 0.00. We saw nobody, but I would expect moderate usage in the warmer times. By purchasing your hiking gear through these links, you will support this web site and it won't cost you anything more. Take NM 152 out of Silver City to NM 15 (towards Pinos Altos). After 18 miles (possibly 25), you should reach the junction with NM 35. Turn right on 35 and go until you see either a sign for the hike or a sign for the Lake Roberts Picnic area. 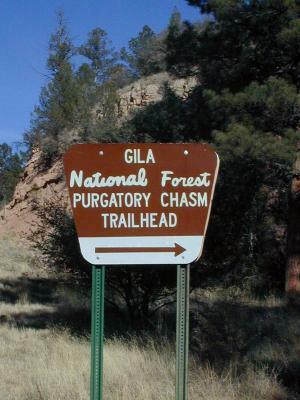 The trailhead is across NM 35 from the picnic area. You start on a flat trail going through a Ponderosa and Juniper forest. There is a sign that says to beware of flash floods. Given the canyon that part of this trail goes through, this is a warning to heed; if it may rain here or up the mountains, you should hike some other trail. 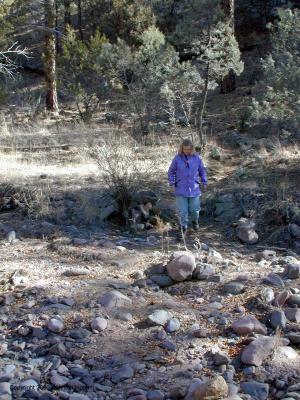 Not far from the trailhead, the trail crosses the stream. It was dry when we hiked it, but I would expect that it may run in the spring. You can see Diana Northup crossing it in the image to the left. After about 1/4 mile you get to the wilderness boundary (PCY1) and a fork in the trail. You can take either fork, but I think you will enjoy the trail better if you take the right branch and return on the left. 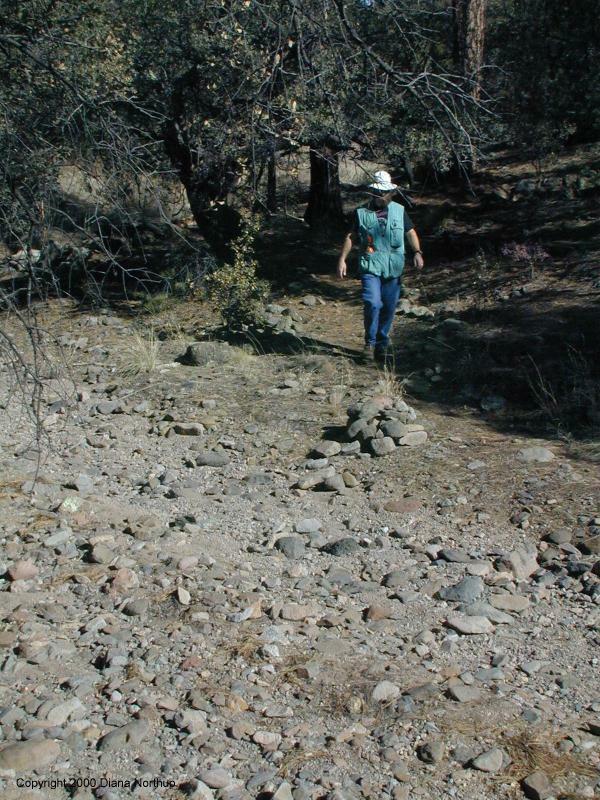 You begin to climb a small hill, and as you climb the water available to the plants must drop---the vegetation changes from Ponderosa to Piñon, Juniper, and cholla. At one point, you see a canyon developing to the right. 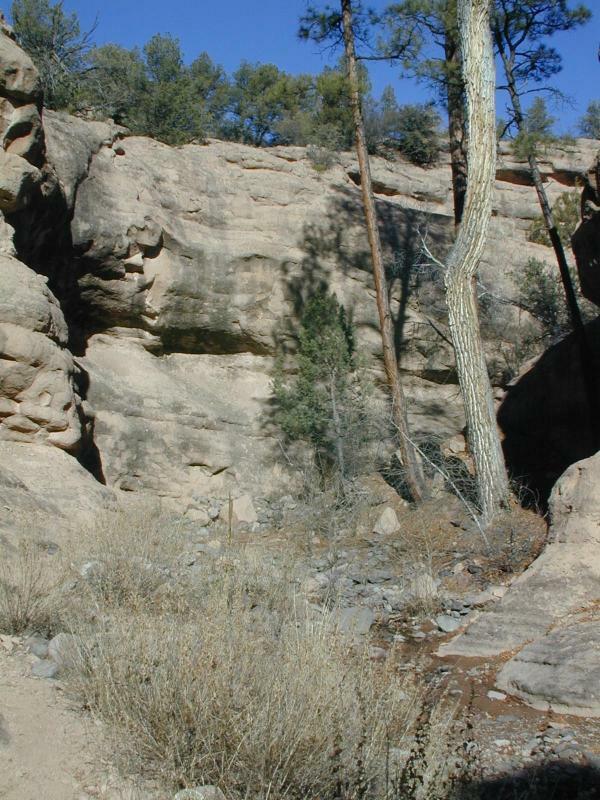 However, you will be going up on the mesa and not up that canyon. When we hiked this trail, we unfortunately saw evidence of someone who had not used a Leave No Trace ethic for their campground. At (PCB3) there is a sign that says the trail is not maintained the next 1/4 file. 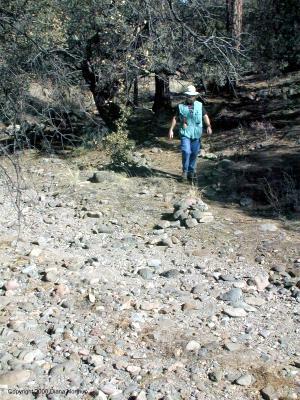 We had no problems following the trail, and it remained in fine shape when we were hiking it. 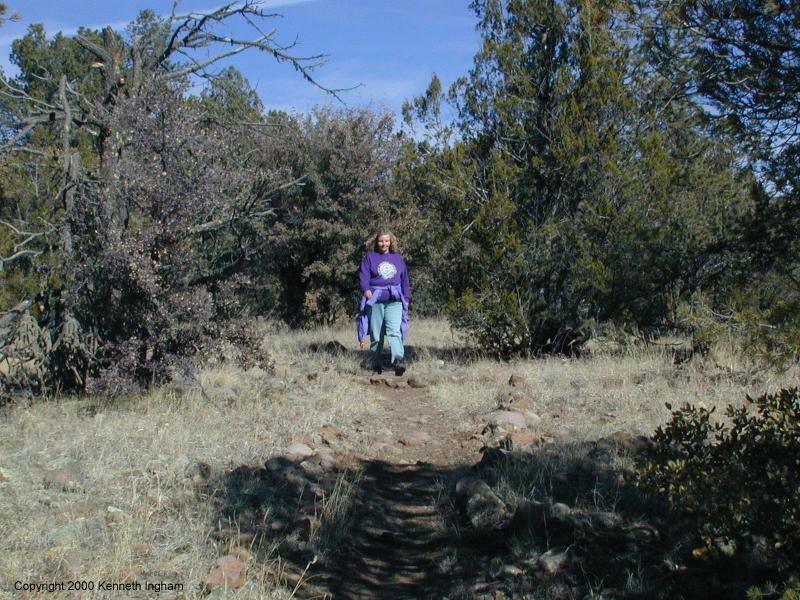 After the sign, the trail descends down the hill. At the base, you can see the chasm that you will be hiking in. The trail parallels the chasm for a short while before descending into the chasm. After a short distance, the trail descends down a ladder. There is what looks like a swimming hole and a small waterfall here. Since there was ice elsewhere in the stream, we decided to pass on the swimming for this trip. As you continue hiking, you come across another sign, this time for the people going the other way on this loop, that indicates that the next 1/4 mile is not maintained. 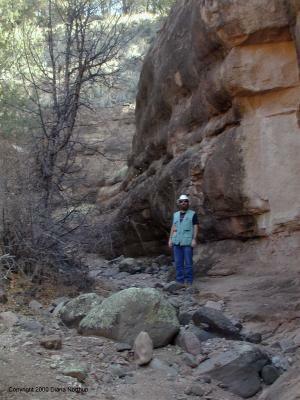 From here, cairns sometimes mark the trail, which wanders up and down the sides of the canyon. 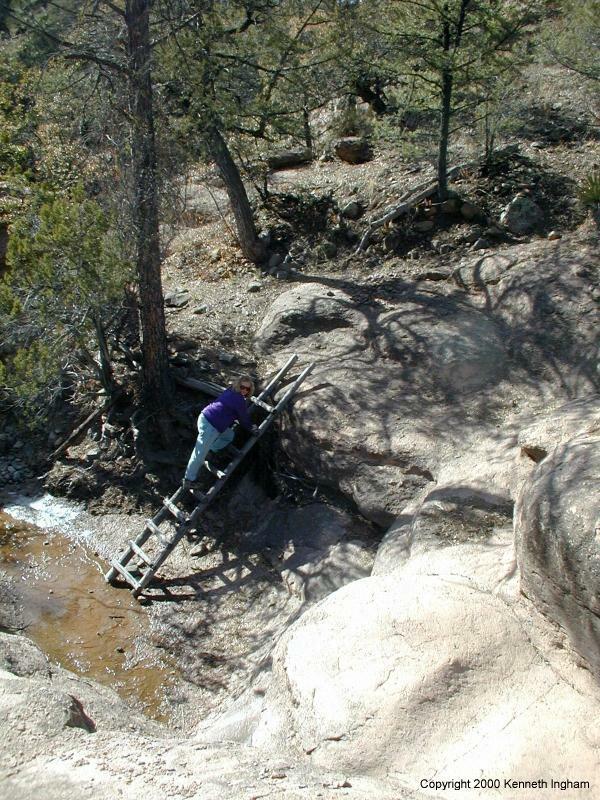 A little more hiking and the chasm opens up suddenly. When this happens, you are close to the Y where you took the right branch. Our favorite trail in the area dramatic narrow canyon searching for rocks along the way. 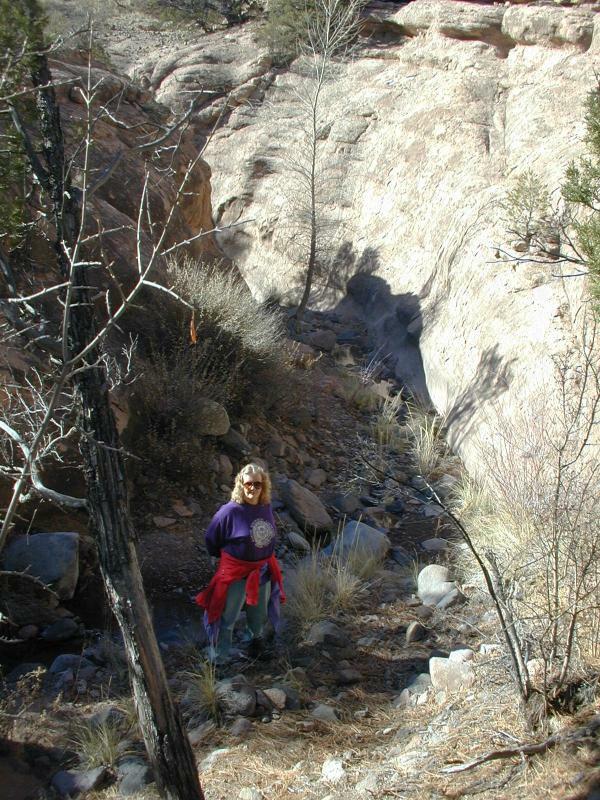 A real gem of a short hike - we were blown away - only spent an hour max hiking this short loop - most of which is in a small creek canyon. This is very near Lake Roberts. Add your comments about the Purgatory Chasm Loop hike.